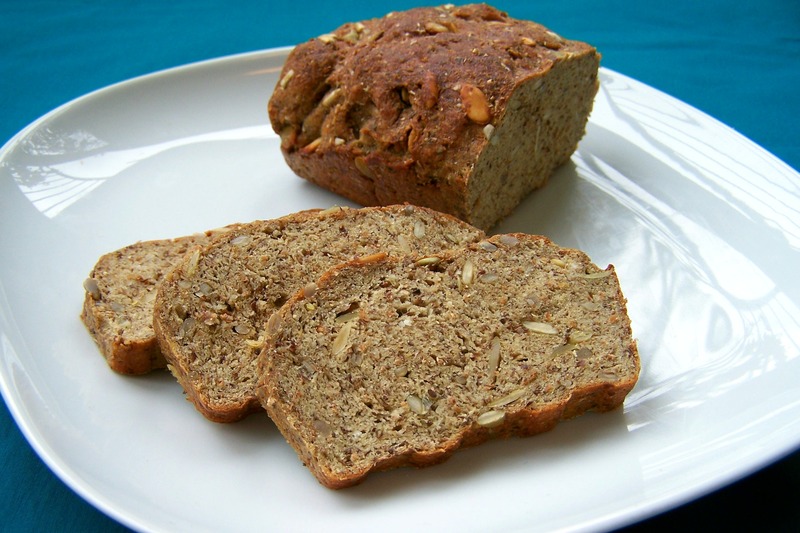 Low carb high protein bread is a great way to turn a simple soup or salad into a meal. This focaccia contains a fraction of the carbs in regular bread and is nicely soft and fluffy. If you want to reduce the carbs even more, you van use protein powder instead of soy flour. The ingredient list might seem a bit on the long side, but half of it is herbs, so it's actually quite a simple recipe. Serve this focaccia with some delicious Italian soup of a salad, or make it into pizza like I do in this recipe. You can easily double the recipe to make two focaccias, so you can freeze one for a later meal. Mix the dry ingredients (soy flour to thyme) in a bowl. Make sure to break up any clumps. Add the water and olive oil and mix with a fork until it forms a dough. Knead it with your hands for a minute or two. Sprinkle a clean work surface with some extra soy flour or protein powder and use your hands or a rolling pin to shape the dough into a flat oval shape of about 0.5 inch or 1.5 cm thick. Transfer the dough to a sheet of parchment paper and cover it with foil to keep it from drying out. Put it in a warm place and let it rise for about an hour until it puffs up a bit. Preheat the oven to 400 F / 200 C degrees. Transfer the parchment paper with the dough to an oven rack. Brush the top with some olive oil and sprinkle on the rosemary, pepper, salt and olive slices. Bake the focaccia 12 à 15 minutes until it has browned. Let it cool for a little while and then serve it warm or cold. It will keep for a day or two at room temperature, or for several months in the freezer. 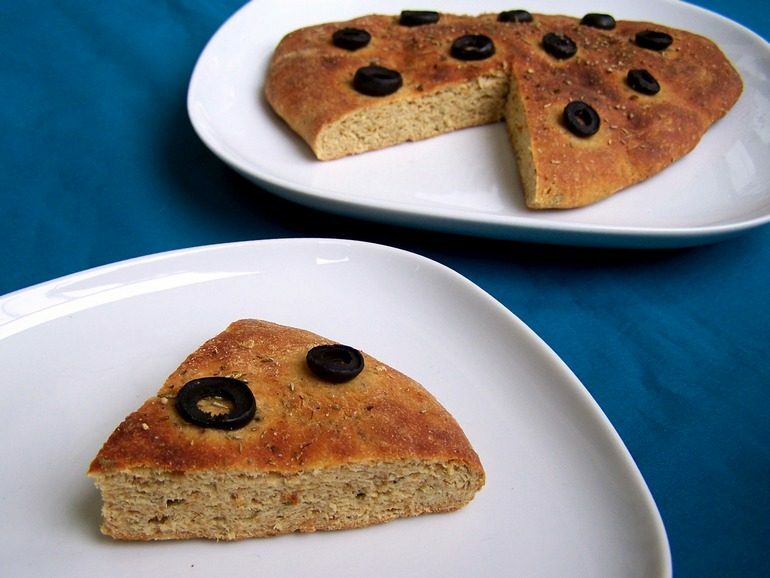 One portion (1/4 focaccia) contains about 171 kcal, 11 g fat (1 g saturated), 5 g net carbohydrate, 4 g fiber en 13 g protein. Knead some olives or pieces of sundried tomatoes before you let it rise. Leave out the olive oil and mix a tablespoon of pesto into the dough. Make Indian naan by replacing the thyme and oregano with 2 teaspoons ground cumin. So delicious! I used wheat germ instead of wheat bran and it was awesome. This recipe absolutely made my night. Texture is exactly what I had hoped it would be and the taste was wonderful. Thanks for sharing! That's awesome Vivian, thank you for your comment! BLOWN AWAY. Thank you for this wonderful recipe. I baked a loaf last night and ate the entire thing throughout the day today. I made avocado toast for bfast and a "chikn" club for dinner. Cant wait to make my through the rest of your recipes. GENIUS! That's wonderful Emma! I'm happy you enjoy the recipe so much.